Hip-hop seems to be having a good year, we have had a lot of music for every conceivable area and sub genre. We even have had beef from some of rap's young talents and everyone seems pushed all over. We have new news in the streaming wars with Tidal, Apple and Beats Music for which they paid Dr. Dre and Jimmy Iovine handsomely for their business. That leads to the newest release from Dr. Dre, and it's not Detox. This album is called "Compton" and is timed to continue to prime the public for the upcoming NWA biopic, Straight Outta Compton which comes out next week. Synergy. 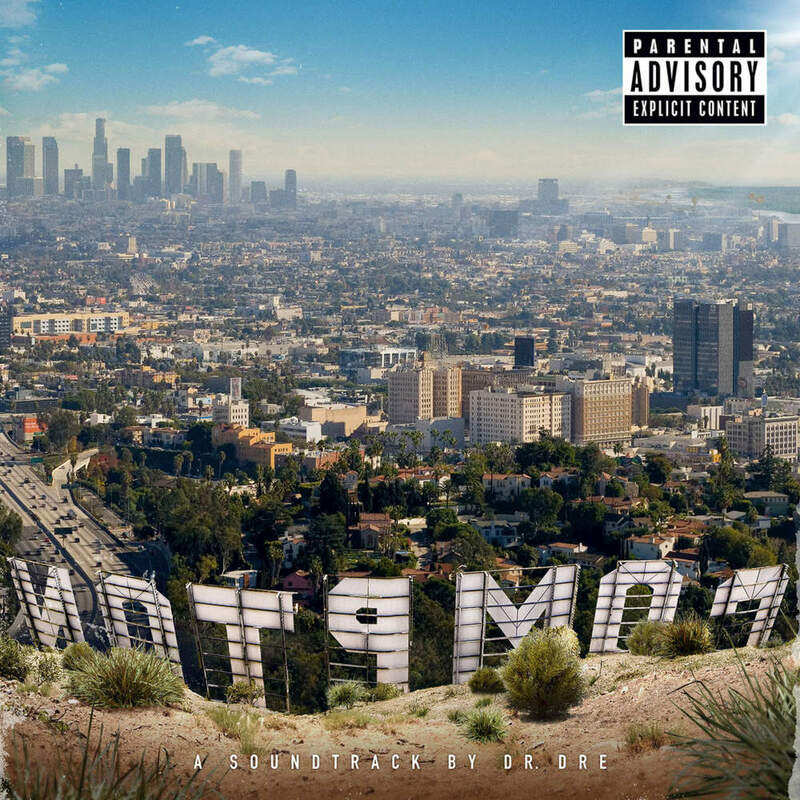 While everyone is excited, let's take a minute to review the new album from Dr. Dre, "Compton"
The album starts off with "Talk About it" with newcomer King Mez and Justus joining Dre on a trap/west coast infused track with a serious bass line that reminds you of down south but the sample still brings home the good feel that's familiar from Dre. The hook from Justus does remind me of something Drake would have done. "It's All on Me" has Dre handling the rapping duties solo but joined by BJ the Chicago Kid and Justus for the chorus. The song sounds like some West Coast rider music as Dre reminisces on his time in the industry. The funny thing is Dre manages to have incorporated new modern styles in the delivery he gives from his writers. It's interesting since we all know he has writers but he hasn't dropped anything in well over a decade so for him to be able to make the adjustment is...well interesting. "All in a Day's Work" is interesting as it features an artist named Anderson.Paak who has a really distinctive vocal sound as he sing/raps at times going back and forth with Dre whose verses had to be written by Kendrick Lamar on this song. The chorus is handled by Marsha Ambrosius. "Loose Cannons" features a return from Xzibit to a Dre project and also Cold 187um over a really serious and heavy track with bass that bangs and a switch mid track that adds in rapid fire drums that mimic gun shots just slightly. The album ends in a skit about the murder and disposal of a body. I could deal without it honestly. "Issues" features Ice Cube with one of his best verses in years and Anderson.Paak once again. Snoop teams up with Jon Conner on "One Shot One Kill" which is one of the harder songs on the album. Now the Game's presence is announced early at the beginning of "Just Another Day" which features Asia Bryant on the chorus. The beat is some classic Dre with hard hitting drums and bass and horn sounds that amplify the beat and Asia's vocals on the 'chorus' which is just an example of another day in Compton. One of the most talked about songs is "For The Love of Money" which features Jill Scott on the hook and verses from Dre and Jon Connor. The drums on this reinterpretation of the Bone Thugs In Harmony classic are crazy and it's a great example of how to refresh something. It also ties the album in with Easy E and his legacy by using a well known song from the group he found and made successful. On "Medicine Man" Em has one of his best verses in a minute as well as he starts off about the beginning of his career and the reaction to it before getting really into it and threatening to destroy any challengers and gives examples of how ill and serious his bars are. Now there is a bit of a controversial line but he prefaces it a couple of bars earlier saying he's going to go back across the line, even though the more offensive word is edited out. "Genocide" might be the most 'west coast' underground song on the album production wise. The Kendrick Lamar and Marsha Ambrosius assisted song reminds me of one of the album cuts from an early Xzibit or Ras Kass album. "Darkside Gone" has King Mez and Kendrick along with another hook from Marsha Ambrosius on a song that features the beat switch that is extremely prevalent today but this song is tough overall. I mean the start of the song has this one feel and after a 'bridge' featuring Easy E vocals, the change in tone makes a lot of sense and works well. The song also features what some are seeing as subliminal shots at Drake. The other song that has people buzzing because of 'disses' is "Deep Water" where after Dre spits about being guarded and having been successful on a dangerous environment where most can't make it, Kendrick throws more barbs in the Direction of the Toronto rapper. Snoop and King Mez join Marsha Ambrosius (who is all over this album) on "Satisfaction" which is another true West Coast feeling song. Anderson.Paak has a bit more of a showcase on "Animals" . The album finishes with a Dre solo on "Talking to My Doary" where he just spits our his 'thoughts' . Overall this album is a great reflection of the West Coast because these guys really make cohesive projects that focus on production and the tone they want to set. I don't see this as having many singles type songs but truthfully it doesn't need it. After multiple listens, I'm fine with saying this is a more accessible version of To Pimp a Butterfly because the songs are all built in an unconventional manner but the production is easier to get into. The bass and drums kick throughout the album and it never really ventures into that 'over produced' territory where someone should have left an idea or two on the table. Now rhymes wise some folks are going crazy over King Mez but I'm not so ecstatic, he doesn't ruin anything but at the same time I'm not clamoring for more. Same with Jon Connor things are alright, sometimes a bit above average. Kendrick is Kendrick and while he may not be at his most obtuse and dense here he does well and considering pretty much everyone was pulling double duty writing rhymes for Dre that made sense for him it's not bad at all. A lot of singers and just newness which Dre enjoys doing so it can be a little odd for instance Anderson.Paak doesn't do much for me but some folks will love him for just existing. This is a worthy listen in my mind and perfect to get folks in the mood for next week's NWA release and the appropriate surge in their music the movie should encourage.